In the brief for the reporters without borders task, the aim is to reach more members and to get more people to know about them. We have chosen to invest in a fairly interactive (in daily newspapers) solution. Our idea was to get the reader to understand what press freedom means in a very easy and relaxed manner. We urge the reader to look for something that is not in our newspaper, something we never see in our newspapers or even react to. We want to get the reader to actually turn the page and look for the red lines, to look for the censorship. 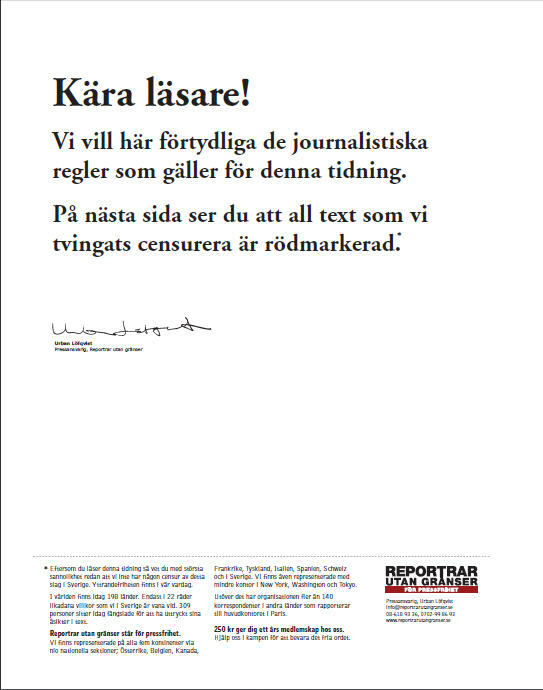 So when the reader turns back to the page again, they recognize that there will be no red mark because we have freedom of the press in Sweden. Then the reader reads the body text where the information on the Reporters without Borders is. We have chosen to avail ourselves of a very simple layout, no picture and no colors that stand out. We have chosen an editorial tone for the ad; we want to create a cognitive process in the reader’s mind after we have chosen to refer to something that we know will not happen in Sweden, red text, censorship in daily newspapers. The primary target group are professionals who daily reads the newspaper and are 40-60 years old and who live probably in one of the metropolitan regions, the secondary is the same audience, but 30-60 years. Our audiences do not like to be written in the nose, hence why we have used just text with a formal verging on pompous. Censorship feels very far away from us here in Sweden, and we are accustomed to not even considering that media is censored. We feel fairly secure in our right to freely speak out, compared to other countries where there are very serious consequences for just speaking your mind. This work was made by Stefan Andersson, Carl-Henric Andersson and myself. The 48h race takes place in Stockholm on 25-27th March and is Sweden’s only advertising contest for students. Each participant will have 48hours for the project and will be divided into teams of three. Each team member will have a role; a copywriter, an art director and a strategist. The competition, teams will have 48 hours to design a full-page advertisement from a given brief. The client is always a non-profit organization and is kept secret until the brief day. The winning entry will be published in three of Sweden’s largest daily newspapers, Dagens Nyheter, Göteborgs-Posten and Sydsvenskan. Those students who are invited to participate are from these univerities: Beckman, Bergh’s School of Communication, Forsberg, Department of Advertising and Public Relations (GI, IHR, Markit 2 and 3 and further training courses for advertising and PR), Gothenburg School of Economics (focused on Marketing), KY-Akademien, Stockholm School of Economics (only those who study focused Marketing), School of Design and Crafts (HDK), Konstfack, Marketing Academy, Hyper Island (Stockholm) and AcadeMedia Masters (only those who read creative marketing or project management information technology and media production). Winners will also be rewarded with 20 000 SEK. All entries will be on public display at an exhibition opening on 8 April.